Have you ever struggled with back issues for spending long sitting hours at work? We all aim to be productive at our work more than anything else. This adrenaline often makes us forget that we are humans and our body has its limit. It may come as no surprise that sitting for an extended period of time can cause pain in the back. According to a research by the Central For Disease Control, around 125 million American adults have lower back, neck, joints, spine and sciatica pain. These are common problem for people who are in desk job and have to spend most of their working hours in sitting position. However, investing a little money in a workplace efficient chair can permanently relieve you from this health risk. You need a perfect office chair that can give you optimal support for your back with comfort. In a hurry and looking for the best office chair for back pain? Check out our top pick. This is the most comfortable and good looking chair for lower back pain. How do you know which one is the best office chair for lower back pain when there are so many choices of chairs to choose from? In the table below, you’ll see a variety of the best office chairs for back support. By using this guide, you’ll be able to find the answers to questions you may have about the functionality and comfort of the perfect chair you’re searching for that will help you find relief in no time. My number one choice among the 10 office chairs is this sleek Herman Miller Aeron. You have the option to customize it to specifically meet your needs, making this chair the perfect choice. It has a contemporary style and is great for all types of settings. It looks nice both in a sophisticated business place or a casual at home office. The Aeron model has 9 different ways that you can adjust the chair. The chair has a Kinemat tilt mechanism which allows a natural pivot of your hips, knees, neck and shoulders. It also has a PostureFit mechanism that provides support to the tilt of your pelvis. These natural pivots help my spine to stay aligned, decreasing my chances of back pain. Many chairs have a contoured back to provide support to the spine. The Aeron’s back is both high and wide which provides support to the back as well as the hips. This design will help relieve you from the pressure that you may feel on your lower back when sitting in other chairs. It has a special Pellicle suspension which allows you to remain comfortable by keeping you cool, releasing any body heat that may build up from sitting. When you sit for long periods of time, you tend to build up your body heat. This special material will help you to remain cool. In addition to being comfortable, supportive and modern in appearance, this chair is also eco-friendly. Over half of the chair is made from recycled materials. The chair as a whole is 94% recyclable itself. The chair comes with a 12-year warranty. On top of everything, I recommend this chair because it works wonders for people who suffer from lower back pain. It features an ergonomic design that easily molds to the spine, making you feel comfortable while promoting health in a plain fashion. The only thing you might not like so much is the price. This is a high-end chair, which means that it doesn’t come cheap. 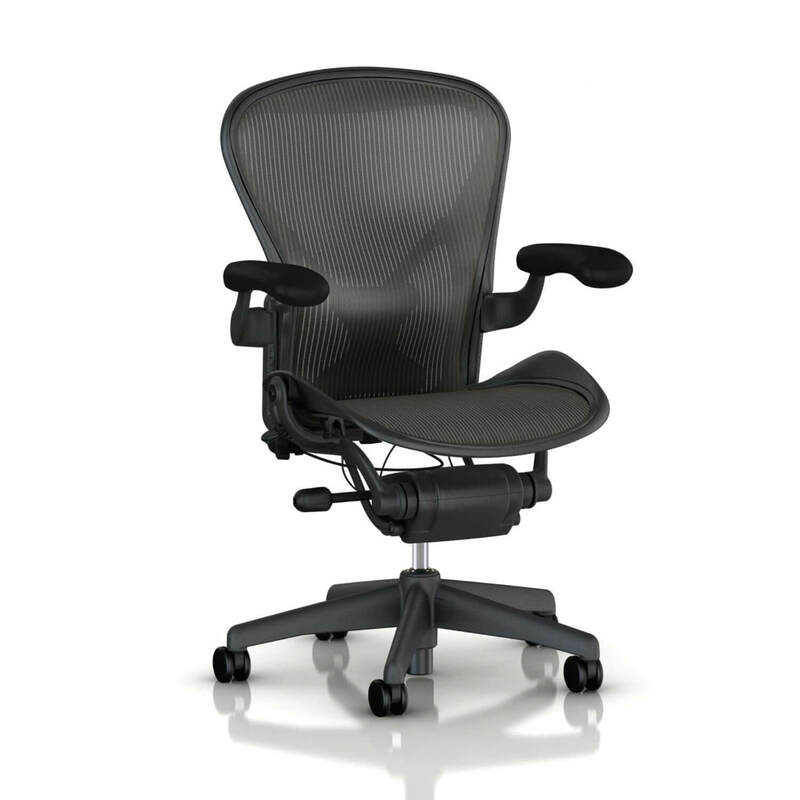 Sitting on Herman Miller’s task chair feels remarkably comfortable due to superb mesh fabric materials. This chair works like a charm for people who suffer from lower back pain. The chair has a tilt limiter with 3 different posture options: full recline, mid recline and upright. The back is comfortable and supportive. There is an adjustable seat angle. The chair comes in 2 different colors. Belongs to the “high-end” price point category – most people find this chair to be quite expensive. Sometimes the levers stick, making it hard to adjust the chair. This beautiful leather swivel chair comes in two different colors, both black and white, with the options of gold, rose gold or chrome frames. The Flash Furniture Swivel chair has a variety of features that give it the power to relieve you from back pain. The 360-degree swivel of this chair is an added perk. With the swivel, I am also able to quickly move around to talk to coworkers, without causing stress on my back, hips or neck. There is also a tilt tension adjustment knob to adjust whether your chair rocks or reclines. I used the tilt lock mechanism to lock my desired tilt in place. While also adjusting the seat’s tilt, I was also able to make changes to the height with the pneumatic seat height adjustment option. The Flash Furniture chair is designed with a high back and built in lumbar support. The high back helps with not only lower back pain, but strain in the upper back, as well. The waterfall seat helps to keep your blood circulating. The padded arms of this office chair provide a great amount of cushion. My arms were able to properly rest while in the sitting position for many hours throughout the day. The chair is offered in a unique all white color option. The chair is easy to assemble and comes with all tools needed to do so. The high back promotes good posture. The 360 Swivel allows quick turns with no strain. The waterfall style seat stimulates healthy blood flow. The high back design prevents long term pain. The lever does not always hold up. There is fine print on the warranty, make sure to read carefully. This classic, fabric covered office chair is simple in appearance, but very functional, providing great support to the back. The adjustable lumbar gives even more support for your back as it fits well within the curve of your back. The chair is made with a unique foam, as well as slats along the back of the chair and in the seat. By balancing the heat and humidity, the Leap chair keeps me cool. Most chairs come with lumbar support, but with the adjustable lumbar you are able to customize your chair to fit your specific body dimensions and preferences. The Liveback technology is pretty common among high-end chairs, and it was used in the construction process of this one as well. It mimics and simulates the natural shape of a spine, reducing the pain and promoting health along the way. I enjoy how I can change the seat depth to make changes if necessary in order to have the chair provide comfort for my legs as well. The Leap Chair supports a variety of postures. Changing postures helps to relieve pressure on the spine after sitting for hours at a time. The Leap chair has a natural glide system. When you recline, it smoothly glides forward. It also has a seat with a flexible edge. You can adjust the arms in four different directions; width, height, depth and pivot. This allows you to naturally rest your arms in the position you desire. When you adjust the arm rest, you will be able to better support your wrists, elbows and neck. There is also an option to set how much push back you will experience when reclining. The back stop allows you to adjust the angle of the recline to the one that best fits you. There are five positions to choose from. When creating the Leap Chair, three facts were kept in mind. Each person has a unique spine. The lower back needs a different type of support than the upper back. The distance that is created between you and work space may increase when you recline. The Leap chair is created with specific intentions of improving comfort and encouraging a healthier way to sit, while efficiently getting work done. The materials used to construct Steelcase’ office chair are superbly durable and long-lasting. There are 14 colors to choose from. The chair has a special technology that allows it to conform to your body, mimicking the shape of the spine. The chair is up to 94% recyclable. For an added fee, you can choose to have it assembled by an expert. You can customize how firm the lower back cushion is. Even though it costs a lot, Steelback’ office chair boasts a huge value for the cash. Not real leather, but very easy to clean and nice in appearance. The price of this office chair is quiet high. Here we’re looking at another fine office chair from Herman Miller, and this one comes with the same graphite frame like the last one. There are certain similarities between this model and Herman Miller Classic Aeron Task Chair, including a variety of colors and styles, the durable parts, easy assembly process, reliable features, and so on. The Embody chair is a commonly recommended chair for those who specifically sit for 4 hours or more a day and have back issues of some sort. The Embody chair was designed after multiple conversations were had with over 30 different physicians, as well as, PhDs. This adjustable back gave me the option to create an alignment that fits with my spine. It forms a natural curve. The Embody Tilt lets me sit comfortably whether I sit completely upright, or in a “deep” recline. This unique feature sets this chair apart from others, giving you an advantage of the ways you can sit comfortably. By sitting in different positions, you actually relieve the strain that is being put on your back, reducing the amount of overall back pain. When compared to other standard office chairs, the Embody evidently improves six important cardiopulmonary functions. One of these functions is resting heart rate. Along with heart rate, this model also encourages movement and posture changes. These result in healthy circulation and blood flow. To assist in promoting healthy postures to relieve back pain, the chair features a tilt limiter. The seat depth as well as the arms are both adjustable to customize the chair to fit you specifically. Herman Miller’s Embody office chair is supremely comfortable. This office chair is built of premium-quality polyester textile materials with a graphite frame. The majority of features of this chair are fully adjustable. You’re free to choose from 16 color and style variations. There is a 12-year warranty. Because it is made in the USA, the chair comes fully assembled. Herman Miller’s Embody office chair belongs to the “expensive” price point category. Takes some time to customize to your liking. Though the DXRacer is designed with intentions of being an ideal chair for gamers, it is known as a favorite for those working in the office. I enjoy the 3D armrests. They not only provide support for my arms, but also for my wrists and shoulders as well. The arm rests are also adjustable. They move inward and outward. The unique seat of the DXRacer is wider than many other office chairs, with “patent race car seat breathable material.” This material provides a comfortable seating environment for you, despite how long you may be sitting. This leather like seat offers a good amount of space for people of all sizes. It has a 5-point metal base. The chair is very sturdy. The built-in head rest allows the neck to rest comfortably. I get relief for my neck and feel less pressure on my back. This makes sitting much more relaxing, whether it be to play games or to file documents. A quality headrest can make a difference in the pain your lower back may feel when sitting. When neck and head have a firm resting spot, your back will have the opportunity to relax instead of feel pressure from the lack of a headrest. The chair also comes with a lifetime warranty on the frame and a 2-year warranty on all of the parts. The chair itself provides a lot of sitting room. It is firm, but comfortable. The breathable material keeps you cool. There are 2 reclining options and it reclines similar to a seat in a car. It has a built-in head rest. The cushion may be too firm for some, feeling stiffer instead. Can be noisy sometimes when reclining. The Ergohuman Swivel chair has a very modern appearance. It comes with a variety of important features that will prevent lower back pain. The chair has not only an adjustable seat cushion, but an adjustable headrest and back as well. The chair meets the needs of a variety of people. The lumbar has an adjustable height, too. The adjustable lumbar let me remain comfortable during the long days of sitting at my desk. Good posture can play a role in back pain. The Ergohuman is designed with a synchro-tilt mechanism. This mechanism encourages you to sit in a way that is healthy. The mechanism works both while reclining and while sitting upright. Using the tilt lock, it is easy to keep the adjustments of the angle at which your back reclines in place. You can use the tension control to adjust how far back you recline. The pneumatic cylinder is a nice addition to quickly raise or lower your chair when need be. Sitting in the same position for long periods of time can cause strain to the lower back. The reclining option tends to be overlooked as a luxury option instead of a necessary one. However, when I recline, my body feels better. It relaxes my back muscles. There are 7 different colors to choose from. The modern appearance of this chair, along with its mesh material, makes it a quality choice of chair to choose from when considering comfort and support for extended periods of sitting. If money is an issue at the moment, there is also the option of a 12-month financial payment plan that you can look into. As for the price, this chair is certainly not cheap, but it’s not too expensive either. Namely, the Ergohuman’s office chair belongs to the “medium-expensive” price point category, and It’s remarkably valuable for the bucks. The chair is made from 97% recyclable components. Armrests can be adjusted low or left off completely. The chair has nylon casters allowing it to roll really well. Really supports the lower back. Mesh material is very breathable. Ergohuman’s office chair is supplied with some of the latest state-of-the-art technologies and features. Depending on size, the mesh material could give out sooner than expected. It’s hard to follow up after Herman Miller’s products, but I daresay that Flash Furniture will be able to keep up. I’ve prepared a small review of a neat, budget swivel chair that’s pretty affordable, but highly efficient in relieving lower back pain – a great combo of low price and efficiency, if you ask me. Generally, this is not one of the most beautiful office chairs you’ll see in your lifetime, but it looks just fine. Regardless of the aesthetics, this chair excels in various other spheres of performance. This model of the Flash Furniture chair is great at promoting circulation with its waterfall style seat. By promoting different postures of sitting, this chair provides overall back comfort. The spine is a key part of the body and when I sit in this chair, my spine feels nice and aligned. My lower back pain is minimal while working from this chair. Using the tilt lock mechanism and tilt tension adjustment knob, I am able to modify how I sit. I can choose to sit upright or to recline. By making these adjustments, I am able to find support for my back, neck and legs. The adjustable head rest aids in providing comfort for your neck when you move it up and down. The pneumatic adjustment lever also allows you to make changes quickly. This feature is great because I can customize the seat to the height that suits me best. The black mesh is well ventilated and provides a more comfortable work environment for you by keeping you cool throughout the day. Unlike the other Flash Furniture model, this one has flip-up arms. This feature is a wonderful addition if you like to have an armless chair sometimes. Instead of going through the hassle of removing the arms off of the chair altogether, you can choose to simply flip them up. Though some may like the high back on this chair, you may not. I personally enjoy how high it is. The chair does come in three different styles; high back, mid back drafting chair and just mid back. Anyhow, it’s quite easy to deduce that this chair is pretty good for the buck. It’s a budget chair which is capable of helping you with your lower back problems due to exceptional lumbar and lower back support. This Flash Furniture office chair is very affordable, and one of the best models in the price range. The mesh back provides great airflow. The curved back encourages you to have to sit properly, relieving the back pain. The chair swivels, allowing you to make quick rotating motions. It has some plastic parts, but they are heavy duty. Superb lumbar and lower back support. The majority of the features are non-adjustable – the armrests, as well as some other features can’t be adjusted. This office chair looks too ordinary to be called “beautiful”. The TOPSKY mesh chair is a contemporary styled chair that features a unique design in order to provide the ideal support for your back. The unique skeletal back frame on the TOPSKY provides great support for your spine. When I sit in the TOPSKY I am able to spend more time focusing on my work, rather than on the back pain I am experiencing from sitting all day. Its breathable coat of black mesh creates incredible air circulation. I don’t know about you, but there have been so many times when I needed to hang a bag or a jacket. One of the best features of the TOPSKY is its hanger on the back of the chair. This practical, but functional feature is the perfect solution to this problem. I hang my jacket on the hanger every day. The adjustable lumbar and headrest provide a way for you to customize how you sit. The headrest can be adjusted 3 different ways and each way provides comfort and support. The armrest is also easily adjustable with just the click of a button, changing the height to better suit your liking. Being able to support up to 300 lbs., this chair is very durable. It greatly supports your back during a long day of sitting. Both the headrest and lumbar support are adjustable. High-density mesh and thick sponges provide significant stability to the back. For an additional fee, it has the option to be assembled by an expert. Headrest has an adjustable 45-degree angle rotation. Armrest padding is very soft. Very supportive for the back as a whole. Has only a one-year warranty. Available in 2 colors only. This beautiful upholstered brown leather chair is a great choice when trying to find relief from back pain. The combination of both appearance and functionality are what set it apart. It has casters that roll as smooth as butter and a 360-degree swivel. This chair provides an efficient way to work, while also maintaining your comfort during the many hours you must remain sitting. The swivel feature sets it apart from other chairs. The swivel is a key feature for allowing you to find some relief in your back. Being able to quickly and freely move in this chair allows your neck and shoulders to relax, relieving the back. The cushioned, butterfly seat plate is well padded. I stay relaxed when I sit on it. There are several adjustable settings and contours that are curved on this chair. The chair supports your back by helping keep your spine aligned in the way that it should. Raising and lowering the seat is easy to do with the pneumatic control handle. While you can raise and lower the how high the seat is with this handle, with the same handle, you can also tilt your chair. The tilt handle lets the chair rock or stay still. The tilt-tension knob is located under the bottom of the chair. It has a 250 lb. maximum weight capacity. The chair is upholstered in bonded brown leather and PVC. It has a contoured back, creating great support. The arm rests are curved for better comfort. This office chair belongs to the “budget” price point category. The chair itself is very heavy. Because of the material it is made from, it may have an odd smell upon arrival. This beautiful, eco-friendly leather Serta model comes in 11 different styles. The variety of styles are great for both the at home office, or professional business setting. This chair provides a look of luxury. The option to add a 3- or 5-year warranty on the chair is an added bonus to the many great features it has. There is a special Active Seating technology. This technology lets me have a great deal of support in my back and allows my pelvis to remain in a natural position. This technology is known for its similarity to the pelvic tilt exercise, an exercise used often to lower the pain felt when sitting for long periods of time. The headrest and arms are layered with heavy, ergo body cushions. These cushions are both durable and supportive. As with any great office chair, the Serta has not only height and seat adjustments, but armrest adjustments, too. You can also lock your adjustments to ensure your favorite position will be there when your return from getting up. The chair is easily adjustable. It has a luxury look to it, though reasonably priced. The manufacturer has been around for 75+ years. This is one of the most beautiful chairs for back pain on the market. Serta’s office chair for back pain belongs to the “budget” price point category. There are a variety of chairs to choose from but finding the best office chair for back support is crucial to improving and preventing back pain. Below are just a few of the key features you should look for when shopping for an office chair. With an adjustable lumbar, your lower back will be well supported. Many chairs come with lumbar support, but not all chairs have an adjustable lumbar. I recommend that the lumbar be adjustable as it provides a better support when you can adjust it to fit your specific needs. Keep in mind that it’s the lumbar support which promotes a healthy spine, aligning it in the proper way so that you can work unobstructed and unfocused by back pain. It is no question that this feature is one of the top features to look for when picking out an office chair as this is ultimately the reason you are shopping for a chair in the first place; back support. There are usually three different options for backrests, low, mid and high back. High back is what is encouraged as it provides the most support for your neck and head, which improves the overall pain in your spine. Being able to adjust your backrest is important as well because this will help you to customize the chair to fit your specific body type. By being able to tilt your chair, you are providing your back with more options for a variety of positions, allowing your back to not stiffen or develop pain from remaining in one position the entire time you are sitting. A 360-degree swivel has been known to decrease the strain that is placed on your back because it allows your entire body to move, rather than forcing you to twist or turn to get something while sitting. This feature is often looked over, however by finding a chair that has it, you will see a reduction in the pain you experience in your back. Though some people prefer a chair with no armrests, I recommend finding one that has some that are cushioned, but firm. By having a place to rest your arms and elbows, you are practicing a healthy posture that will not only relieve the stress that is put on your back from sitting all day, but also encourage healthy blood flow. If you are adamant about not having armrests, I recommend purchasing one of the chairs that has the armrests that you can swing up, allowing you to feel like they are not present, without having to go through the hassle of disassembling the chair to remove them. When you sit for extended periods of time, your body may become hot. By choosing a chair that is made with a breathable mesh material, you will be much more comfortable in your environment. The mesh material is able to keep your body cooled down, allowing you think more clearly and remain focused on your work. Maybe you view this feature as a luxury option rather than a necessary one, but while resting your arms is important for blood flow and back relief, the headrest is equally important. By resting your head comfortably, you are allowing your neck and shoulders to relax and remain in a proper posture, reducing pain that may otherwise occur throughout the spine. If you find a chair that has an adjustable headrest, that is even better as you can customize it to your height. There’s a world of differences between a high-end office chair and budget office chairs. First of all, the materials – more expensive chairs are built from quality materials, hence they’re more durable, stable and reliable. The same doesn’t apply to the majority of low-end models but there are some exceptions also. On the other hand, high-end office chairs usually feel more comfortable and provide additional lumbar, back and head support (with special features) whereas lower-end models might achieve the same thing with ergonomic properties of their design alone. How does sitting related to lower back pain? According to Arrowhead Clinic, up to 40% of people claimed that they have experienced back pain as a result of sitting for many hours at a time at work. What is known as chronic back pain is the result of sitting in a chair improperly; slouched, shoulders shrugged, or hunched forward. When you sit in this position for 8-hour work days, 5 days a week, your spine is put under a great deal of stress, resulting in back pain, normally in your lower back. The spine may begin to change from its correct S shape to a C shape due to the strain. This strain could result in the lumbar disc wall to feel increased pressure. In addition, your spinal ligaments could stretch, causing more severe things to occur. All of these could potentially lead to the back pain you experience while sitting. Though sitting itself is not necessarily the issue, sitting in an improper posture could be. Some chairs have too much cushion, encouraging you to sit in a more relaxed way in which you may sit with shrugged shoulders or slouched over. This posture builds up tension in the neck and causes pain throughout the spine. This is why it is important to find a chair that will not only support your back but will encourage you to sit properly. Is your chair destroying your back? Though your posture can easily play a key part in what is causing your back pain, you may be shocked to hear that it could also be the lack of a good quality chair. That’s right, your big, cushioned, office chair could be the very reason you are experiencing so much pain. “About 65 million Americans suffer from back pain,” claims Dr. Michael Roizen. All because of something so simple as the chair you sit in, you could be a victim of the back pain we speak of. With the way your body was created, when you sit in an over cushioned, extremely soft chair, your body’s natural desire is to slouch. This style of sitting is a result of a chair that encourages bad posture. When you shrug or slouch, your shoulders and neck tense up, straining your back, specifically your lower back. In order to reduce that strain, it is important to sit in a chair that will not only support your back, but promote a healthy posture to ensure back pain will be limited. The best office chair will have many features to help support you while sitting for long periods of time. However, if you currently have lower back pain, then you will want to follow these tips on the correct ways to sit in your office chair to improve and relieve the back pain. Always keep your legs uncrossed with your feet flat on the ground. In order to relieve pressure from your back, durable and comfortable arm rests are important, though not necessary. You may prefer not to have armrests, however using them is encouraged for back pain. Remember to always sit up straight, allowing your back to rest against the back of the office chair. Keep your weight evenly distributed across your hips. Make sure your knees are level or even somewhat about the hips; a footstool is sometimes encouraged to maintain this. When moving in your chair, don’t twist, but rather turn your entire body with each movement you make. By following these guidelines, you can not only comfortably sit in your chair, but you will also encourage healthy postures and relieve any pain you may be feeling in your lower back. It’s no surprise that sitting in a chair for hours on end will result in some type of back pain. Because sitting puts pressure on areas such as your neck, shoulders, arms or legs, all connected to the spine, it is important to find different ways to help reduce some of the back pain you are experiencing. To improve lower back pain, you will want to take frequent breaks when sitting for extended periods of time. Getting up from your chair and walking around for simply 5-10 minutes every half hour or so, will make a huge difference in how you feel. Switching positions when sitting will improve the pain as well. A brisk walk around the office will keep your blood circulating and allow your back to have a break from sitting in a fixed position. If you find that you don’t have time for a walk, or perhaps your shoes aren’t the best for walking in, taking 10 minutes to stretch once or twice throughout the work day will improve your back pain by keeping your joints and ligaments feeling loose, allowing you to feel relaxed. Frequent movement, no matter how short or long will work wonders to improve your lower back pain. A high-quality office chair could be the difference between a pleasant day of work and an intense life of back pain. The best office chair for lower back pain is durable, firm, yet comfortable and encourages you to sit correctly in order to prevent pain in the back or to help relieve current pain in the lower back. Just as you are unique in your own ways, each office chair is unique in regard to the way it conforms to your body. I personally am a fan of the Herman Miller Classic Aeron Task Chair because it was able to meet all of my needs. It provided me with both durability and comfort, relieving me from the strain I felt on my lower back. Finding a chair that fits you perfectly, curving in ways that will help to support and align your spine is crucial when sitting for extended periods of time, so make sure to pick one that will be best for your specific needs.